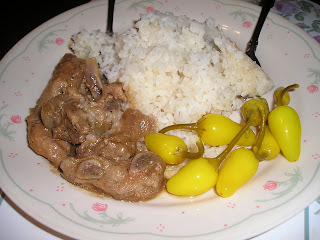 Our ulam (main course) yesterday was pork adobo. How do you cook your adobo? I don't really follow recipe, I enjoyed creating or inventing my own menu. 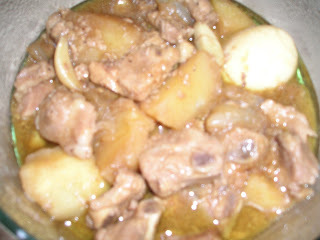 Hubby like adobo with Mang Tomas Sauce in it.. It gives a little sweetness to it. We also put boiled eggs because our daughter love it (i like it too), its delicious. I dunno if you guys add potatoes, but its good too. Here's my plate, don't be surprised to see some hot chili in there, remember that I am from Bicol and we are very fond of eating spicy stuff. John introduced me to this pickled chili which is hot and I like eating with my food with it (interesting combi eh?). It gives me more appetite, meaning I'm going to have these maximum bilbil again. 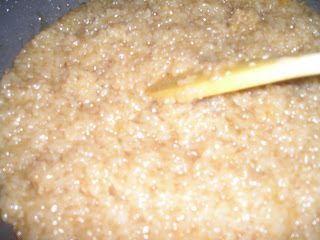 Oh well, I'll just double up my work out then lol..
Hubby and daughter love sweet rice so I made them some for their dessert. I ate fruit as my dessert. So there you go my friends... I'll post tomorrow what we had for today.. See You all tomorrow...I'm going nyt nyt now.. God bless!